We are very happy to share our most recent news and events from the community. This month we also wanted to share with you all a beautifully captured moment from one of our community Bhajans which was recorded earlier in the year. We hope you enjoy it as much as we do! Please also remember we can stay in touch through our website and Facebook page. In meditation, we are doing the same thing: we dive deeper and deeper into the Heart, into that mysterious Kingdom of Stillness, staying there as long as possible. We hope that when we come back to the surface, the pearl of Truth will prevent us from being drowned again in the world. No matter where you are in the world, you can now share the beauty and devotion of our bhajans through our new video. Subscribe to our YouTube channel and sing along! On June 19th, Hridaya teachers Ali and Elena offered a Divine Feminine workshop, a very powerful event honoring sisterhood. A beautiful group of shaktis came together as part of a day of sharing, healing, dancing, and exploration of sacred rituals. Not only was it a special gathering, it coincided the first solstice full moon in more than 50 years! Last month, the Hridaya Mazunte team was invited to a special 4th birthday party for Johan Osmar, our amazing cook Celia’s grandson. It was a wonderful celebration with Celia and Ana’s extended family following the school community’s efforts to raise money for his cochlear implant. There were many delicious treats and several piñatas! We will continue to offer assistance to Johan during his ongoing treatment and thank you for all the love offered from the community. We are very pleased to present Craig’s workshop on Conscious Masculinity September 1st-3rd. Wild at Heart will share teachings and practices aimed at awakening the Spiritual Heart and rediscovering the essential masculine paradigm. We hope our spiritual brothers can join him for this special event. We are excited to announce that the Hridaya Yoga Center will offer a 3-Day Silent Meditation Retreat in Spanish October 10th-12th. 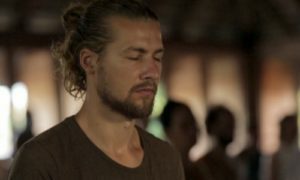 Our beloved teachers Nick, Luna, and Daniela will guide this inner journey. Help us share the enthusiasm by inviting your Spanish-speaking friends to join us! Click here to see a full list of international Hridaya offerings coming up over the next few months. Blessings from all of us in Mazunte and may the Sacred Tremor of the Heart enlighten your life!